When was the last time you made someone's day? Often times the littlest gesture can make a world of difference and "perk" up someone's day and put a smile on their face! Starbucks customers do amazing things everyday. A customer buys the next person in line their favorite beverage — not as an act of charity or thanks — but an acknowledgement of commonality and humanity. The gesture is small, but the act is endlessly inspiring. In times like these, small acts of kindness like these make a big difference. With that, we are extending a gesture. If you come into Starbucks and buy someone else their favorite beverage, we’ll give you a free tall brewed coffee. We’re hoping this small motivation will encourage you to be the spark of connection that helps bring us all a little closer at a time when showing our unity is so important. 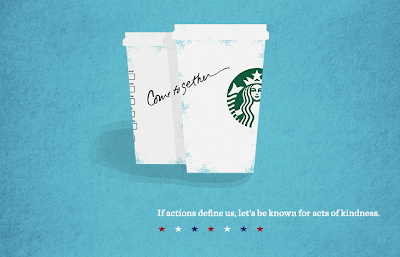 Come together, #payitforward — and lets see what can happen! **Offer good October 9–11, 2013 at participating stores! I shared this via Twitter, Google +1 and Twitter! Let's watch the magic happen!